Denmark Bans The Burqa And Niqab : The Two-Way Danish parliament voted Thursday to prohibit certain garments that cover people's faces in public. Human rights groups say it "violates the rights to freedom of expression and religion." 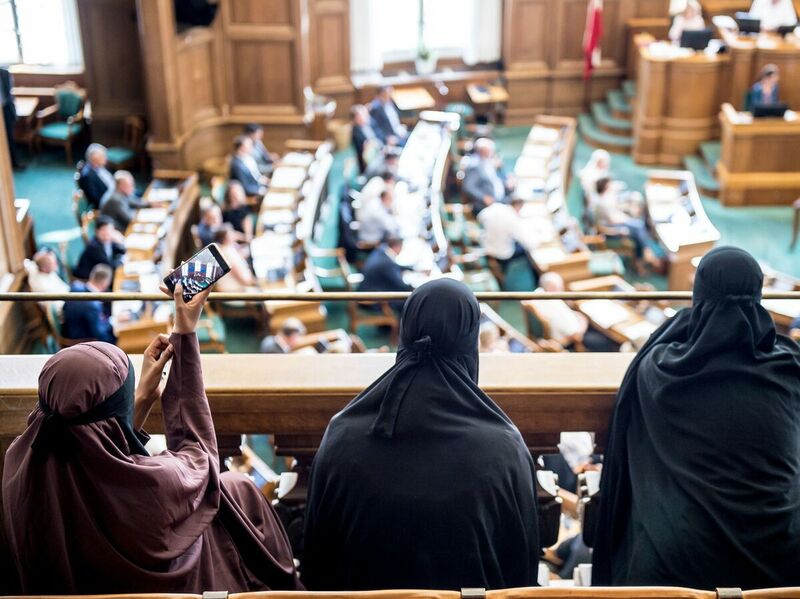 Women wearing the niqab sit in the audience at the Danish Parliament in Copenhagen on Thursday, as a bill that bans face coverings in public passes by a majority vote. The bill was presented by Denmark's center-right governing coalition. It received 75 votes from members of parliament in favor of the ban and 30 votes in opposition. Another 74 members of parliament were absent for the vote. Once the law goes into effect on August 1, it carries a fine of 1,000 kroner ($156) for first-time offenders and up to 10,000 kroner ($1,568) by the fourth violation. An earlier version of the bill also included a provision allowing prison sentences, The Local Denmark reported. That amendment was later removed from the bill. Widely known as the "Burqa Ban," the measure is perceived by critics as targeting Muslim women who choose to cover themselves with the burqa, a head to toe garment, or the niqab, a cloth covering the face. "If the intention of this law was to protect women's rights it fails abjectly. Instead, the law criminalizes women for their choice of clothing and in so doing flies in the face of those freedoms Denmark purports to uphold," Amnesty International's Europe Director Gauri van Gulik said in a statement. He added that the law is "neither necessary nor proportionate and violates the rights to freedom of expression and religion." Shadi Hamid, a senior fellow at The Brookings Institution, told NPR, that the new law has wider repercussions. "It will have the affect of further polarizing society and further alienating the Muslim minority population. There is only one minority group that is affected by this — Muslims." Proponents of the ban say that the veil is a form of female oppression, obstructs communication in schools and court rooms and presents a potential security hazard. But veils have been a source of controversy in Denmark for years. Danish Prime Minister Lars Løkke Rasmussen said in 2010 that "the burqa and the niqab do not have their place in the Danish society. They symbolize a conception of the woman and of the humanity to which we are fundamentally opposed and that we want to fight in the Danish society," according to the Library of Congress. Thursday's outcome was embraced by Danish politician and member of the European Parliament Anders Vistisen who tweeted, "Today, the Danish Parliament approved a law banning burqa and niqab. Congratulations #Denmark!" The Danish People's Party, which had proposed prison sentences, tweeted "finally adopted!" with an image of a veiled woman with a "no symbol" across her face. Because the law allows people to cover their faces for a "recognizable purpose," such as in cold weather, Justice Minister Soeren Pape Poulsen said, police officers will have to use "common sense," according to the AP. Denmark joins the ranks of France, Austria and Belgium who have implemented similar laws.